Beautiful 2011 bay reg Appendix Quarter Horse gelding. Just under 16Hh with a solid build. Goes w/t/c in a frame. 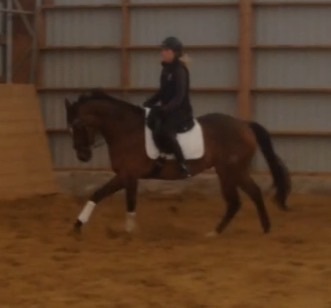 Lovely mover with a very balanced canter. Schooling 1st/2nd level. Started over fences. Will be showing this summer. Very sweet and perfect horse for nervous amateur. Push ride with a soft mouth. Sound, quiet, barefoot. Trail rides. FOR SALE: Stunning Hanoverian/Dutch Filly-SOLD!